We don’t always get to choose our soil. This is especially true when we are children. And while we may grow into adulthood having spent more consecutive years in places far from our home or origin, isn’t it true that our initial soil somehow remains in us, part of us, supplying ground to all of life’s experiences? While others may fondly remember a childhood of climbing trees, I recall more vividly climbing theme park fences . Those places that people from all over the world come to spend their life savings for a week of making magical memories, I would sneak into for an afternoon, to gawk at a cute boy who happened to be employed at the most magical place on Earth, or just because when you are a Central Florida local, you come to learn the fences that are most often unmonitored–making it less likely for a magical memory stealer like myself to be discovered. I’m not proud of my thrill-seeking, park-stealing days, but it is part of my story of being a girl. I didn’t grow up with the smell of red clay lodged in my senses or even the salt sea air which was no more than an hour away from my home. But when you live in the vacation capital of the world without a reliable means of distance transportation, you grow more accustomed to the smell of lighted sulfur rather than the more palatable scent of the ocean breeze. 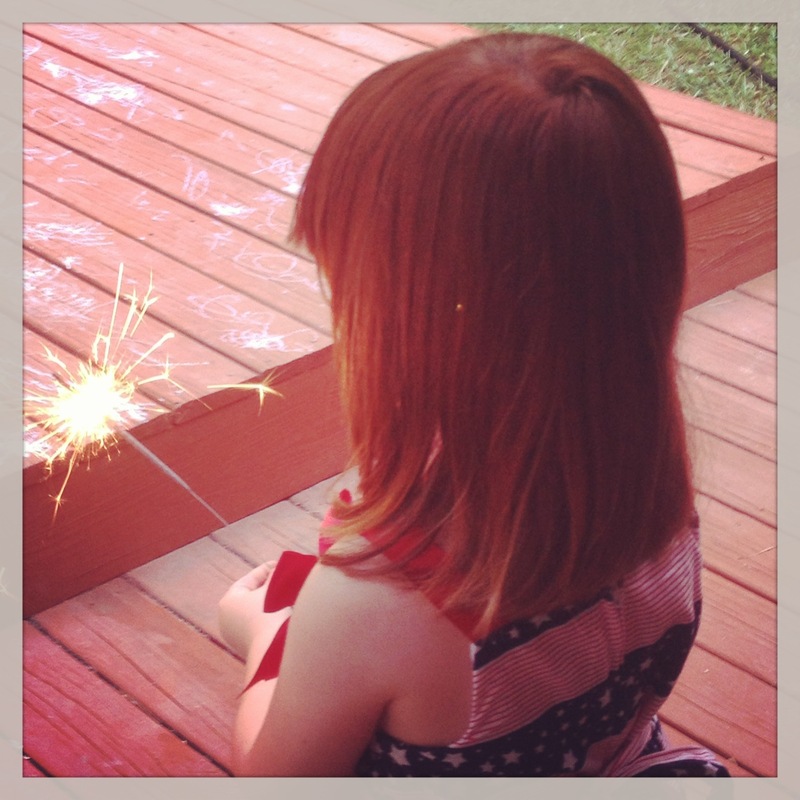 I was rehearsing these memories this past holiday weekend as we prepared to watch the neighborhood fireworks display. My preschool children have been begging me to flip the pages of the wall calendar to the month of July since the sun thawed the Snowpocalypse of 2014. Without being able to yet grasp the concept of time— that no matter how hard we may wish for a thing and anticipate its nearness, we can’t make time move any faster, I feebly attempted to supply them with a visual proximity of time growing shorter and shorter by crossing off the days and weeks leading up to the Fourth of July. While fireworks to my childhood self were as familiar a sight and sound as a passing train, for my children it is a once a year treat which to them must feel more like a once in a lifetime opportunity. All of the weeks of hype and excitement for a 20-minute spectacle of lights kept my children awake at night in their beds. But, the calendar did not disappoint, and the much anticipated night did finally arrive. Perhaps every grown up feels a tinge of nostalgia staring up beneath a fireworks display from past July 4th celebrations, outdoor concerts or sporting events. But something about the sticky heat of the night air and the peppering of glowing accessories lighting up the field, those neon chemical tubes that would no doubt lose their luminescence by morning leaving small children (mine included) in a heap of disenchantment— a piercing reminder that they have to wait yet another whole year for that euphoric albeit brief illumination to grace them again— these all combined to transport me back in time to greet my park-hopping self (sans the pricey park-hopping pass), and for a moment, I was a 10 year old girl again. The intoxication of the memory only lasted for a few seconds. When I looked over at my daughter seated on her grandmother’s lap looking up at the sky with three-year-old wonder, I was filled with more satisfaction at watching the reflection of the lighted spectacle through her eyes, then looking up and continuing to indulge myself in my own sentiment. It was over almost as soon as it began— not much unlike the less complicated briefness of my childhood. For a while, I have struggled to maintain some grip on my more idealistic and imaginative self. She too was a fun acquaintance at 3, 13 and 23, but just as the calendar doesn’t move any faster because we wish it to, I realize now smack in the middle of my fourth decade on planet Earth, it doesn’t move any slower because we wish it to either. Since becoming a mother, now almost 3 times, I have known even before I have been willing to admit that the chapter of my girlhood has ended and that of marriage and maternity has begun. I don’t say that with any tone of grief or reluctance, but rather a gracious acceptance and gratitude. I will never stop being a girl, but the difference now is that I will never stop being a girl who is also a mother. And mothers see all things, including calendars, fireworks, and the soil from which they came in a whole new way.